How to create Code 128 barcodes in Excel on Mac? How to generate 1D barcodes on Mac using Universal Fonts or the Code 128 Fonts for Mac. The Universal Fonts can create 1D barcodes including: Code 39, Code 128, and Interleaved 2 of 5. To create UPCa. UPCe, EAN8, or EAN13, use the UPC/EAN Font Package and VBA file. The IDAutomation_OfficeVBA/MAC VBA folder includes .rtf files for EAN and UPC. The font for this solution is named IDAutomationUPCEANL or IDAutomationSUPCEANL (demo font). The standard Code 128 Font Package encoders do not properly format data on Mac due to a conflict between Mac's Roman Character set and the Code 128 font encoder. 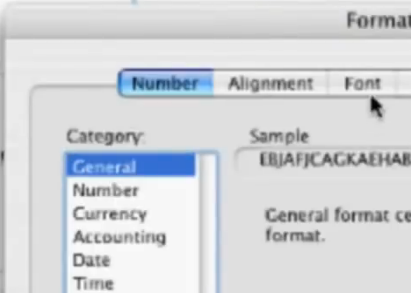 IDAutomation has another solution for creating Code 128 barcodes in Excel 2004, 2008, and 2011 for Mac. 1. Download the demo or purchase and install the Code 128 for Mac or the Universal Font Package. Because Excel 2008, does not include VBA, consider using the AppleScript solution with the Universal or Code 128 Mac Fonts. 2. Open the RTF file for the barcode type to create. The RTF files are included in the font package and are the encoders designed for Excel. Copy the code. If not able to locate the RTF files, contact IDAutomation's technical support. 4. 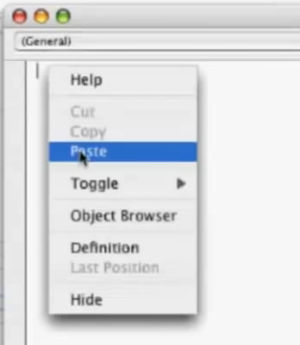 Select Tools - Macro - Visual Basic Editor. 5. 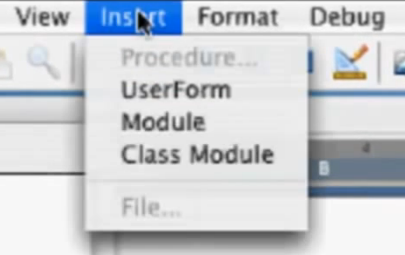 Select Insert - Module. 6. Paste the code copied from the RTF file into the module. 7. Select Debug - Compile VBAProject. 8. Select Excel - Close and Return to Microsoft Excel. In Cell A1, enter 1234567890. 10. Press return. The encoded data appears as uppercase letters. 11. 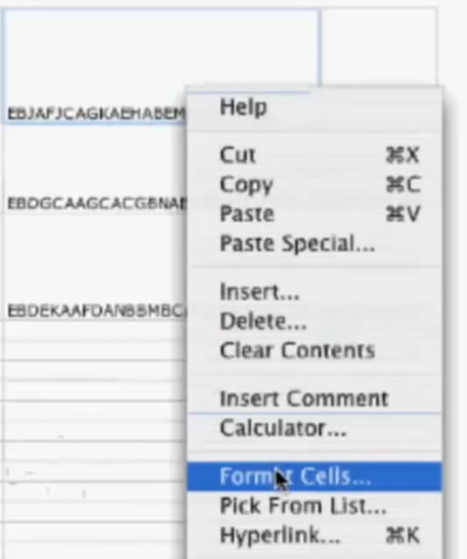 Right-click the column and select Format Cells. 12. Select the Font tab. 13. 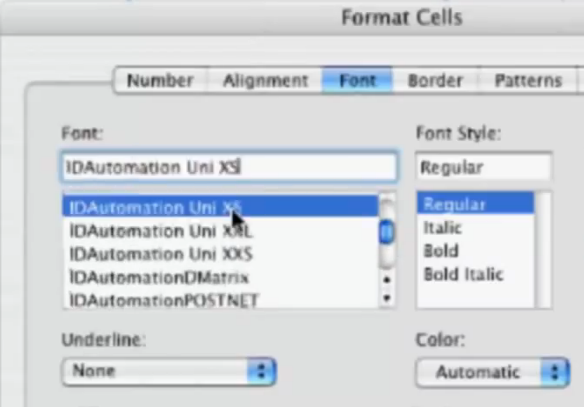 In the Font options, select the IDAutomation Uni barcode font. Example IDAutomation Uni XS or IDAutomation Uni M.